The Seagulls held the lead at every change and were particularly damaging after halftime, kicking nine out of the next 10 goals to help guide them to a 14.17 (101) to 8.10 (58) victory. With the home and away season coming to a close, Williamstown will now await results from the remainder of the round to determine who they will face in a home qualifying final at Burbank Oval on Saturday. Both sides took their time to get adjusted to the blustery conditions, as well as the finals-like pressure being applied around the contest, but at quarter time it was Williamstown who held a three-point lead. With Footscray kicking with the wind in the second term, Williamstown put the clamps on, drying up their scoring opportunities by keeping them to just one goal. 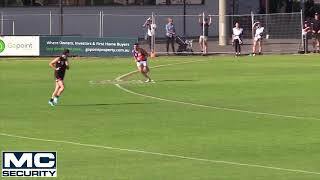 The third quarter provided plenty of highlights for Seagulls fans, with Arryn Siposs' huge mark over his Bulldogs opponent the best of the lot. Playing his first senior game with the club, Jayden Burke added his name to the goal kickers list, much to the delight of his teammates who all rushed to congratulate him. Williamstown piled on six goals to one to essentially end the game by three-quarter time with a 43-point lead, a margin which stayed the same at the final siren. Adam Marcon and Michael Gibbons dominated around the stoppages, getting in first to the footy and having a mountain of the ball between them, even pushing forward to kick a goal each. Brett Bewley was also super impressive, in particular his long, accurate kicking, which helped his team break the game open during the second half. Nick Sing continued his stellar late season form with another terrific defensive job down back, particularly with the likes of Peter Faulks and David Fahey on the sidelines, and was able to lead the defensive unit with aplomb. 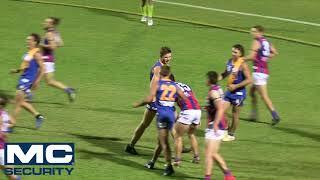 Williamstown's forward line was anchored by Lachlan Schultz and Sam Dunell, who kicked three goals each and provided a fantastic one-two punch with their marking presence and defensive efforts, particularly inside 50. 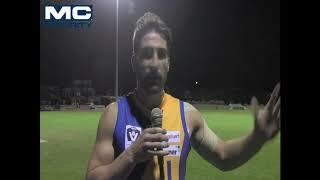 Williamstown will host a home final against an opponent yet to be determined, at Burbank Oval next Saturday. Goals: Schultz 3, Dunell 3, Cordy, Cavarra, Siposs, Marcon, Bewley, Masters, Burke, Gibbons . Best: Marcon, Sing, Bewley, Schultz, Dunell, Gibbons.